I just kind of wanted to throw it back to Chloe's 2007 fall ready-to-wear line, I think it was pretty next level, considering everyone is still wearing chunky combat / lace up boots ("she's angry... funny angry")and these first three looks especially kill it. 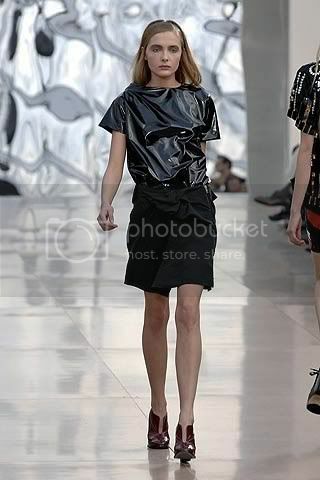 Not to mention the asymmetrical shapes of the clothes were a gross distinction from Chloe's previous leader at the time, Phoebe Philo. 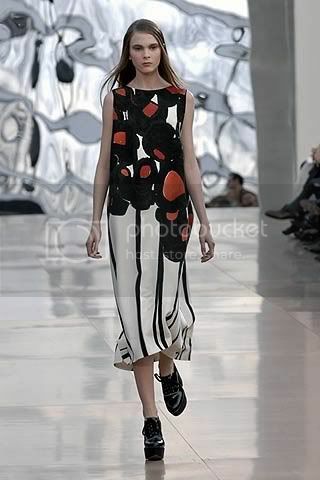 I think this was Paulo Melim Andersson's first line for Chloe, he was hired from that other left-field girlie brand, Marni...and the off-kilter shapes totally have the flavor of his former employment. My roommate just got a pair of Marni shoes at some thrift store in Dallas, and i have to say, i am real jealous. 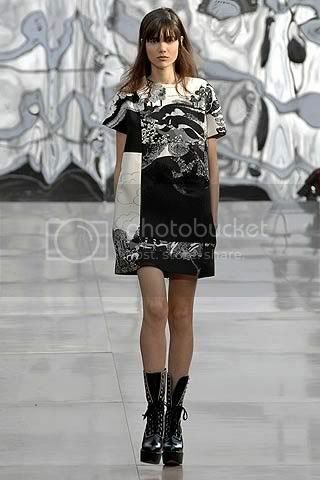 Marni rules, so does Maggie Gyllenhaal, and she wears Marni on the regs. So... this line was after the departure of Phoebe Philo for Chloé in Paris 2007.
anways. that's enough rambling for now. i'm all over the place this morning.